Polaris RZR Factory Racing continued its impressive 2018 season with a dominant performance at the 50th annual Mint 400, the largest and most well-known off-road race in the United States. Polaris RZR Factory Racing had victories in all three UTV classes as Justin Lambert won the Turbo class and Rhys Millen took the victory in the unlimited class. The weekend was rounded out with a podium sweep in the NA class lead by Dodge Poleman, Seth Quintero, and Kristen Matlock. Lambert battled his way through the packed field of 69 turbo cars after he started 59th to take the lead time on the last lap of the race. Seth Quintero finished second in his professional BITD race debut, right behind Dodge Poleman who took his second Mint 400 win in a row. Kristen Matlock was not far behind Seth as she continues to prove why she is the most dominant female driver in the sport. Saturday’s victory continues the Polaris Factory Racing team’s dynamic start to the season that has already seen them capture victories at every major race they’ve participated in to date. 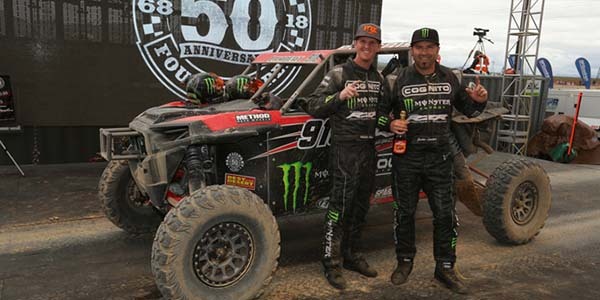 Among the season’s early successes are victories at the Desert and Short Courses at the GMZ UTV Winter Nationals Casey Folks Parker 250, the WORCS rounds 1 and 2, and a podium sweep at the iconic King of the Hammers UV race. Polaris already has 13 wins and 33 podiums on the young season. The Polaris Factory team will look to build on its success when it returns to competition at the UTV World Championships on April 6 and 7 and the San Felipe 250 on April 7.